Jostaberry is a hybrid cross of blackcurrant and gooseberry. It is thornless and produces fruits which are slightly smaller than a gooseberry, dark like a blackcurrant but sweeter. The plant I put in two years ago produced its first proper crop this year. The bush will grow to 1.8m in height – so it can be a bit of a brute. The label says to prune like a gooseberry. The fruit seems to form on last year’s wood. After harvesting I’ve pruned it quite hard. This year I threw a net over the whole bush to keep the pigeons off. This meant I could leave the fruit on the bush until it turned truly black. The fruit ripened about the same time as the blackcurrants, so I made the decision to freeze the blackcurrants and use the jostaberries. 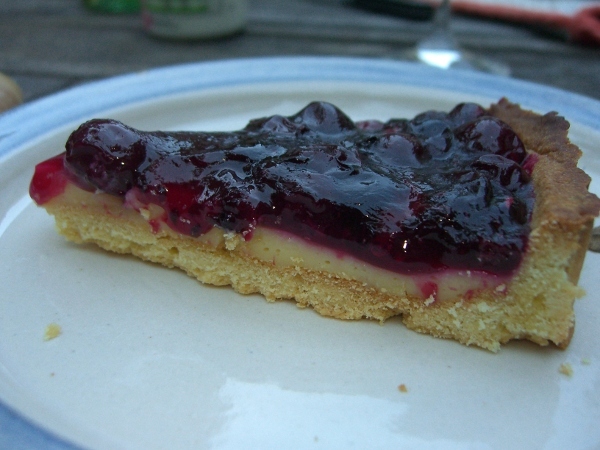 I made a tart with a sweet pastry base, crème pâtissière layer and then a jostaberry topping, inspired by the French tarte au myrtilles. I was making it up as I went along but somehow managed to hit on what seemed, to us at least, the perfect combination of tart and sweet. I promptly made another two batches of the topping from most of the remaining jostaberries before freezing the couple of handfuls left over. I put the topping into Kilner jars, put one in the fridge and processed the second in a steam bath so that it should last in the cupboard for a treat in the winter. Sweet pastry pie crust 9″/23cm – I made my own but you can always buy one. a pinch of salt is traditional, but you might not bother. Make the paste and fill the flan dish and bake off. To make the cream mix the sugar, cornflour and salt. Add the egg yolks and beat to a thick paste. Heat the milk until it starts to simmer and then add one third of it to the egg mix whilst beating. Pour this back into the pan with the remainder of the milk, again beating all the time and heat until it thickens. Turn off the heat and add the vanilla extract and whisk a little as it cools. Spread this into the pastry base and allow to cool. Top and tail the jostaberries using scissors. Put 150g of them in a pan with 100g sugar and a few drops of water. This produces quite a tart topping, if your berries are not completely ripe or you prefer a sweeter topping use a little more sugar. Heat gently until the the jostaberries soften and produce enough juice to dissolve the sugar. Simmer for about 10 minutes, when the berries will start to disintegrate. You should have richly coloured syrup. Add the remaining berries, stir to coat and cover. Cook on a very low heat for about 5 minutes stirring occasionally. The second batch of berries should just soften, but not disintegrate. Mix the arrowroot with a few tsp of water and add to the boiling berries whilst stirring. As soon as the mixture thickens turn off the heat and stir for a few moments more. Pour this topping over the prepared base and allow it to spread to the edge, helping it along if necessary. Allow the tart to cool completely before serving. The same topping would work wonderfully on a cheesecake. We enjoyed ours sitting out in the garden on a slightly sticky Friday evening after a barbecue. This entry was posted in Allotment, Food and Cooking and tagged allotment, cooking, jostaberry, tart. Bookmark the permalink. Hi Julie, I’m thinking it would, especially if they are those red-tinged dessert gooseberries. Maybe if you made the initial syrup with blackcurrants and then dropped the gooseberries into it for the second part? jostas are,to put it mildly, vigorous growers, but also healthy plants!! I grew them in the 90s….thanks for reminding me…I think my daughter has a few plants she grew from cuttings then…must get her to do it again! I made cuttings from the bush when I put it in as it was a bit of an odd shape. They all took so it seems to come from cuttings pretty easily because I didn’t do anything special. I have mine netted now. I’ve picked some blackcurrants but I think the jostaberries will be another week. We picked the Jostaberries again last week and I made pie filling from them. Three batches went into Kilner jars and the rest has been sitting in the fridge until today when I made a tart and put it on the top. 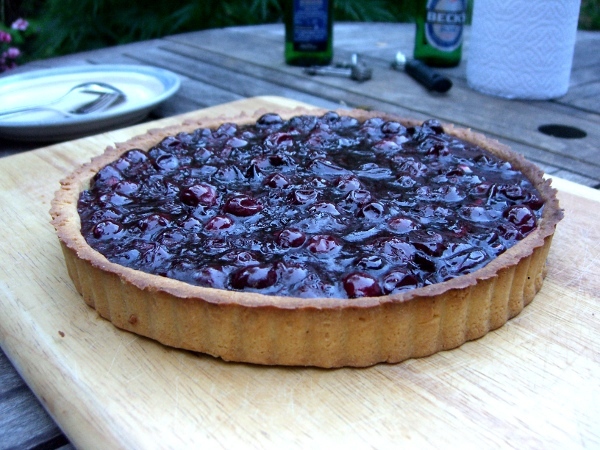 Jostaberry tart treats this weekend!